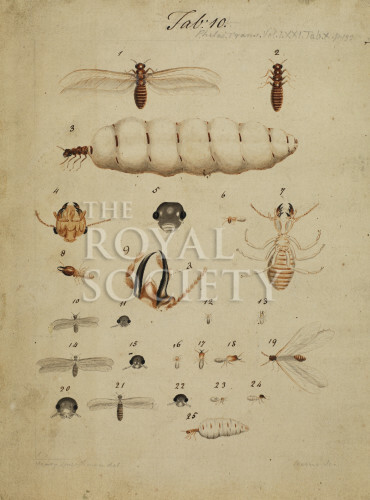 Plate 10 from the paper “Some account of the termites, which are found in Africa and other hot climates”, Philosophical Transactions of the Royal Society vol.71 part 1 1781 pp.139-192. Twenty-five figures illustrating different species of termite, identified by Smeathman as: Termes bellicosus; Termes mordax; Termes atrox; and Termes destructor. The figures show queens, males, workers and soldiers with occasional details of insect heads and mandibles. The painting is headed “Tab 10” with publication, plate and figure details inscribed. Inscribed in pencil, lower left “Hen: Smeathman, del” and “Basire sc”.